Apparently people really like to know how many miles I’ve gone and what route I take. Departed Saint Paul (forever?). Raced sunset, thunderstorms to make camp. First raindrop fell literally as I slid into hammock for the night. 29.5 miles. Early, cold morning. Strong tailwind. Amazing time on brutal hills. Met Mom & Zangmo for lunch in Stockholm, WI. Reached Ryan’s farm at sunset. 41.9 miles. Stayed at Ryan and Rebecca’s farm. Philosophy with Ryan, drinking with Rebecca. Wrote a great deal. Began planning novella. Looped back to Maiden Rock for fun. Could not find favorite house. Love it the first time. Pushed on to Pepin. Made friends, slept outside. 17.3 miles. Dawn with dragons. Lunch in Alma. Ran into new friends from night before. Pushed on, camped at boat landing outside Winona. Visited Winona in evening. 43.8 miles. Arrived parents’ farm! Very difficult biking day. Surprised me. Hills, dehydration? Felt sick on arrival. Budweiser made it worse. 34.2 miles. Stayed with parents. Worked furiously! Created artwork, fiction, nonfiction, and client articles. Sleep deprived. Dad & I custom built new front rig for the Giant. My birthday! I turned 29. Left behind my parents’ farm, maybe for last time. Reached Shrine of Guadalupe at sunset. 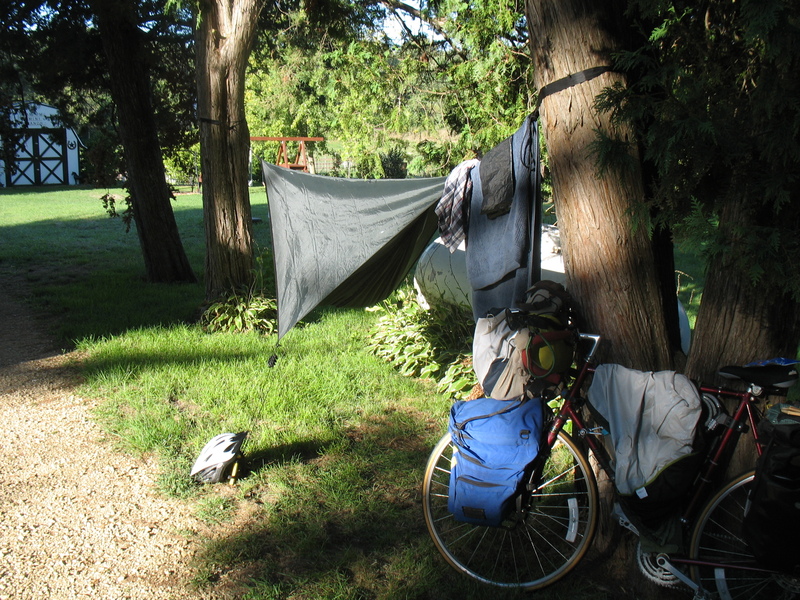 Rejected by friars, slept hour by hour under trees, rain. 47.3 miles. Deliriously sleepy, barely rolled forward. Arrived Prairie du Chien late afternoon, nowhere to stay. A hard day. 56.1 miles. Took day to work, refocus myself in Prairie du Chien. Considered moving to a horse camp, decided to stay put. Ate well, worked little, biked around area. Turned to Couchsurfing for place to stay in days ahead. Departed Prairie du Chien in higher spirits. Mild tailwind, flat route ahead. 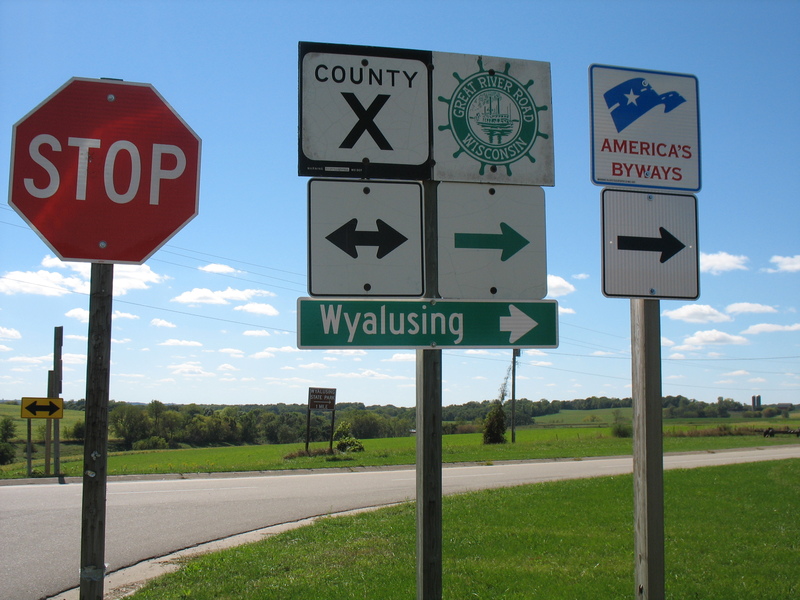 Decided to turn off it up large bluffs to see Wyalusing, an old favorite state park. 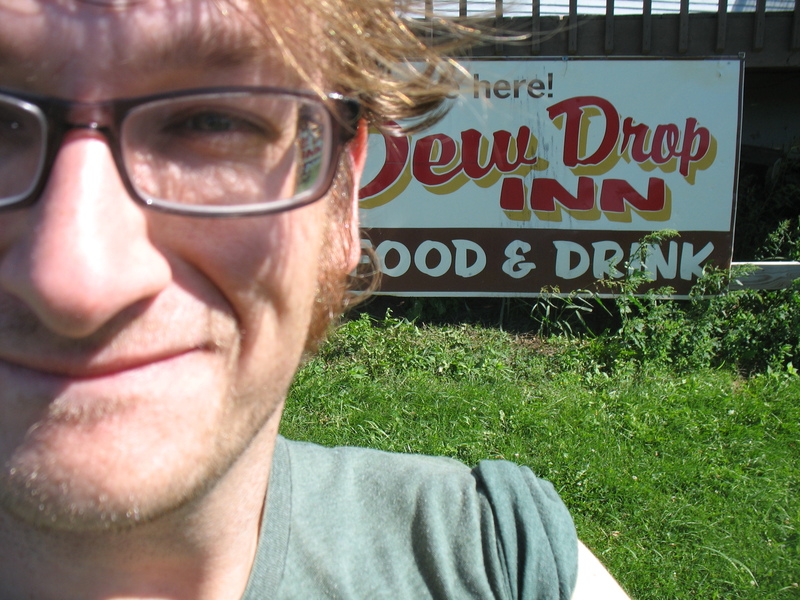 Discovered tavern where we went during family camping trips, the Dew Drop Inn. 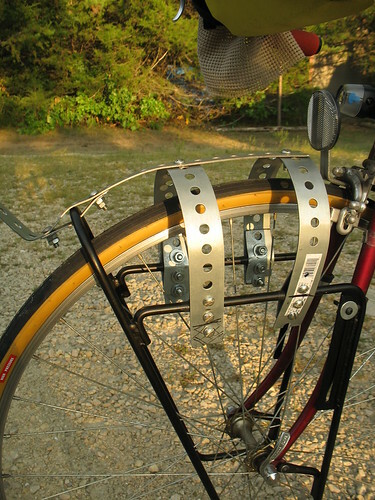 Wiped out, injured self, bent the Giant’s front brake. Camped in yard of older couple at Cassville. 36.5 miles. Fought wind, hard ride. Hills. Stopped at a shrine in Dickeyville and talked to Urban on phone. Turns out he grew up next door to the man who’ll be hosting me in Dubuque! Went way off course to avoid being on freeway. Still had to take freeway bridge to cross the river. Reached Dubuque thoroughly beat. 43 miles. It’s interesting what can be learned by counting miles like this. 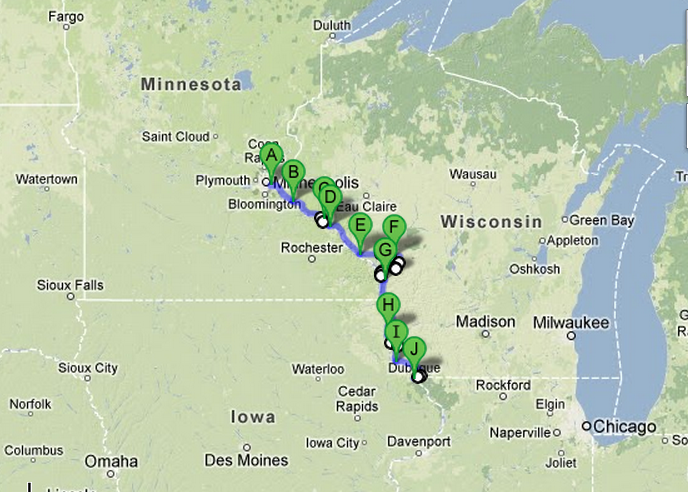 My total travels in the Wisconsin leg amount to 10 miles less than my Minnesota leg, yet Wisconsin seemed vastly more difficult. I’m surprised to see so many days of just 30 or 40 miles—those days often felt long and grueling. From this point on I had no family or friends to rely on, and learning to arrange friendly places to stay became vital. Want to know anything about this leg of my travels? Ask away and I’ll do my best to answer.